USA was part of Group C in the World Cup. Also part of Group C is England, Slovenia, and Algeria. Each team in a group plays each other and receives 3 points for winning a match, 1 point for a draw (Tie) and 0 points for a loss. With all that said, the USA team loves come from behind drama. My heart on the other hand, is not a big fan. With England and Slovenia, USA has had to battle back from a deficit in the second half to get the draw. 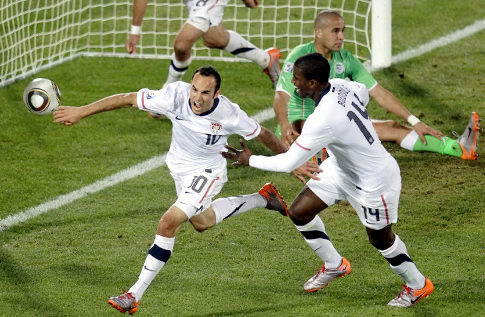 As of yesterday, USA was looking at possible elimination deadlocked 0 - 0 after 90. In stoppage time, on the heals of a strong but unsuccessful Algerian strike, ridiculously talented goalie Tim Howard whipped the ball out ahead of the pack to Landon Donovan who after blah blah blah put the ball in the back of the net off the goalie's deflection. England's win over Slovenia just minutes earlier gave them 1st place with 5 points and Slovenia second with 4 which put USA out of contention with just 3 points. The most AMAZING part is this was in stoppage time. Literally the very last moment left for a score. I believe the referee had the whistle in his mouth and had just inhaled to blow the official 3 alerts signaling the match over. It was like something out of Hollywood... But not. USA wins Group C and advances to second round. Sure, Donovan will get the credit, but he couldn't have done it without my heart racing, head sweating, edge of my seat determination and will to win driving the team to victory! 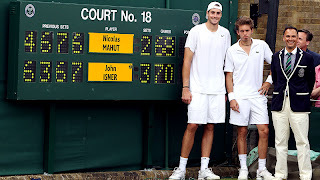 Not only the longest match in Wimbledon, but in Tennis history concluded today after 11 hours & 5 minutes. John Isner defeats Nicolas Mahot 6-4, 3-6, 6-7 (7), 7-6 (3), 70-68. How is this possible you ask? I have no idea. I don't follow Tennis. But from what I've gathered, Wimbledon does not have a tie break, you have to win by 2. Kind of like that ridiculously long hoops game of 1 on 1 you played with your best friend in high school you thought would never end where you both were so tired you could barely stand but neither would accept defeat. Just like that. You'll probably never see anything like this again... Ever. i may be inconsistent, but not all the time. copyright © 2010 david orozco. all rights reserved. Powered by Blogger.